Between the stress of airports and the potential for not eating or sleeping well while on the road, traveling can do a number on your health. Here are my Top 10 Tips for Staying Healthy While Traveling! Even though I claim to be a homebody, I do find myself on the road quite a bit. In the past 10 years or so, I’ve had the opportunity to visit such places as Western and Eastern Europe, Iceland, China, Japan, Cuba, and many parts of the U.S. (read my travel-related blog posts here). 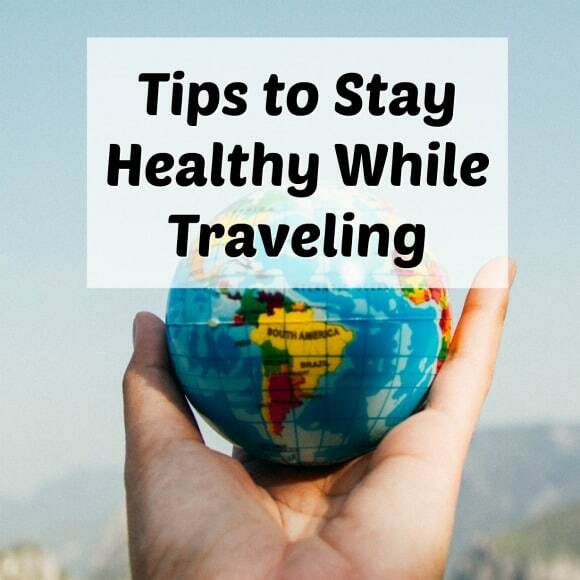 However, there are definitely some strategies for staying healthy while traveling and I thought I’d share some of my favorites, especially as we ease into spring and start to think about planning some getaways. This is a post I originally shared back in 2014, but I’ve updated it with fresh links and tips based on more recent experiences. Enjoy!!! Bring healthy snacks and breakfast foods with you. You can see my recipe for Chocolate Travel Overnight Oats here, and you can swap grain-free granola for the oats if you’re following a paleo diet. Some of my favorite snacks for eating on the plane or in the car include nuts, dried fruit, fresh fruit, dark chocolate(! ), and homemade snack bars like my Chocolate-Banana Oat Bars. I’ve written a whole post just on pre-made travel snacks that you can see here. If you’re in a city environment, it’s not hard to get some exercise while traveling, but do make an effort to get fresh air and walking in every day. A hotel gym is good as a last resort and if I’m at a conference where I can’t be as active, I’ll choose to stand for at least some of the day. City hotel rooms can be teensy tiny, but I use an extra bath towel and do some stretching every evening. Sure, it wasn’t as good as my regular yoga practice at home, but it felt good and I slept better as a result. I finally bought an ultra-thin travel yoga mat that I often bring along, too. Being in airplanes or around people can expose us to viruses, and it’s a sad reality that cigarette smoke is still prevalent in many places, so I make a real effort to get at least 8 hours of good quality sleep to keep my immune system strong. I don’t always sleep well through the night when I’m traveling, but I try to do my best and at least get to bed at my normal bedtime. Some of the items I bring along to help with sleep include these earplugs, this molded eye cover (my husband calls it an eye bra), passionflower capsules, and this mini-sound machine in case it’s super noisy outside. Get a hotel room with a fridge. Since I often go to a market on trips lasting more than a few days, having at least a mini-bar with some space for my food is essential. It’s worth it to me when I have to pay extra for the fridge; it’s usually only $10 a night if it’s not included in the rate. I always make sure my request is noted on my reservation. Research restaurants and markets ahead of time. I like to use the Whole Foods Market store list to search for stores near by me and I also Yelp or a simple Google search for restaurants I might want to visit. This will help your digestion, your energy, and your immune system. Consider taking an extra magnesium supplement. I read about how magnesium can help prevent traveler’s constipation, plus aid in relaxation. There are different types of magnesium and some can have a laxative effect, so do your research and even test your formulation ahead of time to see what will work best for you. The one I take for travel is this one; I just portion out as much as I need and take it along in a zip-top baggie. Ask for what you want at restaurants. Don’t be shy about asking for steamed veggies, an extra-big salad, or your preferred method of cooking (i.e. steaming, butter instead of cooking oil, etc.). It’s your body and it doesn’t hurt to ask (nicely) for your preferences. Have fun and be spontaneous. Even if you’re on a business trip, make travel fun and enjoy the change of routine or scenery. And, be open to change and spontaneity, it’s the best part of travel! What are your favorite travel tips and where are you going on your next trip? Share with me in the comments! Bringing food with me everywhere I go has changed how I travel – I have snacks squirreled away in all my bags. I also plan healthy activities, like exploring on foot, and research restaurant and grocery stores in advance. It’s just easier to enjoy yourself when you’re not HANGRY!! I didn’t know you went to CUBA! I want to hear all about that! Packing snacks has become vital to my travel routine. I also load up on garlic, onions and turmeric before traveling to boost my immune system. And drink a ton of water and wash my hands a lot. Once I reach a destination, I do research on healthy restaurant options, gyms and yoga studios. Plus, I just walk and walk and walk! I also don’t sweat the indulgences, because stress makes me more prone to sickness! So I have one (or occasionally) two desserts in a day, or more coffee than usual, or an extra glass of wine, I chalk it up to travel/vacation and let it be. I’m much more relaxed and far less likely to get sick! Ohhhhh, great suggestions, Liz! I love the idea of researching local yoga studios, but I have yet to do something like that. I keep thinking I would have to rent a yoga mat and that just grosses me out. 🙂 I def have more desserts when I’m on vacation, too, but that’s part of changing up my routine and it doesn’t seem that hard to get back to healthier choices once I get back home. P.S. Cuba was AMAZING, I went on a student visa as part of an industry-sponsored trip when I was in business school and I’ll never, ever forget it. I am actually really disappointed that the embargo hasn’t ended b/c I really want to go back, but I don’t want to do it illegally (i.e. going through Mexico). 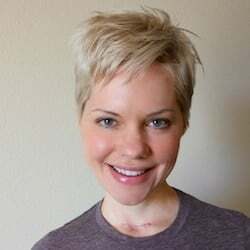 Great list, Carrie ~ all so important to keep in mind. I found a great tip from Gena on Choosing Raw – when you’re taking an average-length flight (6-12 hours, no long layovers), it works very well to make some juice and/or get some coconut water the night before and freeze it. Pack it well for your suitcase, and when you arrive you’ll have nicely thawed, still cold (unless you’ve been traveling for a long time) juice to hydrate yourself immediately upon arrival. When I’m going to a country where I don’t speak the language, I also try to familiarize myself with the words for animal-products. I was in a grocery store in Paris a couple of weeks ago and was about to find vegan food/snacks by knowing some words like lait, beurre, and poulet 🙂 . I have friends who are in China regularly, and when they first started going and didn’t know any Chinese, they carried cards in Chinese around with them that said things like “I don’t eat eggs, milk, butter or meat” and “I’m deathly allergic to ___”. The cards worked until they learned how to say it! Great tips, Kelli, and I LOVE the idea of freezing green juice to have later in the trip. I am going to do this and might even try it with a green smoothie. Thanks!!! These are great! When I travel it’s normally for holidays where indulgences are almost required. I always keep enough fruit and quality juices around for snacks, and I highly limit excess bread, pasta, etc and opt for more….um….moveable…food. Also Goodbelly and plenty of exercise. Even if it’s just walking or stretching. As you mentioned! I always bring food with me on trips. I also bring items that help me fall asleep in a strange bed. These are really great tips. It can certainly be a challenge to stay healthy and make the right decisions while you are traveling and having fun. It is SO important that we stick to our healthy routines no matter what. Great tips! It can be so easy to forgo all the good habits when on vacation, but then you don’t feel your best and you want to feel your best while traveling! Thank you so much for the tips. Staying healthy abroad is a lot more difficult than people think. I agree! Even a few days on the road is hard. These are all great tips particularly about Magnesium. Thanks for sharing! These are all some really good tips. I think walking is one of the best. I love to walk, and that is something I would always do while on vacation. I think having good hygiene would be another thing to help stay healthy. I rarely travel though. These are some great tips. When I am traveling. I always bring snacks and put it on my bag. We need to consider these tips. Awesome and very helpful. These are some excellent tips to stay healthy while in travel. Walking is the best exercise and brings some on-the-go snacks is the must. Great ideas! My husband travels quite a bit and he does many of these things. It is so important to stay healthy while traveling. I know I would not want to visit a doctor or hospital where I am not familiar with. Thanks for sharing these great tips.